Unfortunately for Nintendo, it's become anyone's guess when it comes to which major third party titles will make their way to the Wii U. It seems like major publishers, like EA, don't want to risk Nintendo's small install base on their upcoming properties. Why release a game on a console with a smaller user base? Ubisoft has taken that into consideration and dismissed it for a lot of their big titles. Splinter Cell: Blacklist has joined the ranks of big third party games bound for the Wii U.
Ubisoft confirms that Tom Clancy's Splinter Cell® Blacklist™ is coming to Wii U on Aug. 20 in North America, Aug. 22 for EMEA territories and Aug. 23 in the UK. Tom Clancy's Splinter Cell Blacklist on Wii U will deliver a unique gaming experience that puts players in the role of special operative and 4th Echelon leader Sam Fisher. 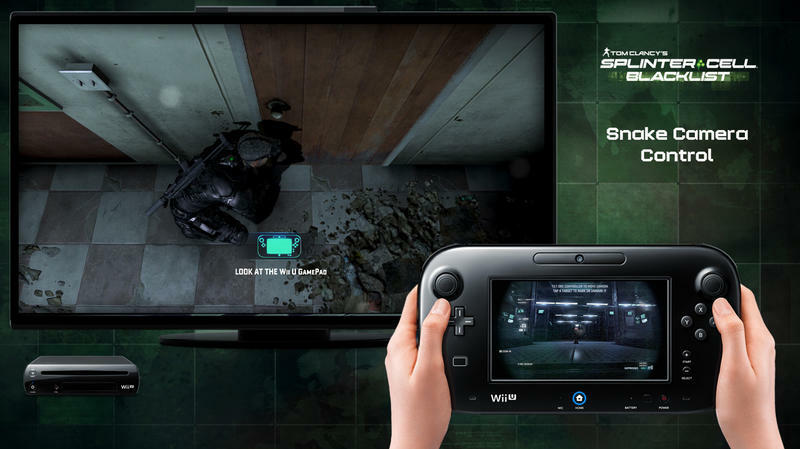 Showcasing enhanced game-play features using the Wii U GamePad controller, Tom Clancy's Splinter Cell Blacklist allows players to operate innovative gadgets, take out enemies and move through the environment, and intuitively switch between weapons, among other features. The GamePad touch screen, along with motion-based inputs, are sure to immerse fans and gamers alike in this thrilling modern-day adventure. As more comes for Splinter Cell: Blacklist and the Wii U, we'll have it. We had a chance to sit down with the Art Director on Splinter Cell: Blacklist to talk about the upcoming game during this year's PAX East. You can read that piece here. REDMOND, Wash.–(BUSINESS WIRE)– Nintendo's third-party partners are bringing an impressive array of great games to the Wii U™ home console, including new games and exclusive information from Disney and Ubisoft®. "Disney, Ubisoft and our other third-party partners have a great lineup of exclusive games and unique experiences for fans of all ages," said Steve Singer, Nintendo of America's vice president of Licensing. "Their creativity spans every audience and genre, creating new ways to play that can only be experienced on Nintendo platforms." Disney Interactive is bringing Disney's Planes, a flying adventure video game inspired by the upcoming Disney animated comedy adventure film, exclusively to Nintendo platforms. The game will be available for the Wii U and Wii™ consoles as well as the Nintendo 3DS™ and Nintendo DS™ hand-held systems on Aug. 6, just a few days prior to the film's Aug. 9 opening in theaters nationwide. The game will expand beyond the storyline of the Disney's Planes film, offering players the opportunity to enjoy the thrill of flight as one of the popular characters from the film. Disney is also bringing Disney Infinity to Wii U, Wii and Nintendo 3DS on Aug. 18. Disney Infinity is Disney's new gaming platform that combines Disney's most popular franchises with interactive figures that come to life in the game. Players can place real-world toy versions of their favorite Disney characters onto a device called the Infinity Base and transport them into the virtual game worlds of Monsters University, The Incredibles, Cars and Pirates of the Caribbean, as well as into a giant Toy Box. "Wii U offers our developers unique tools to showcase our fun franchises," said Javier Ferriera, Senior Vice President, Publishing at Disney Interactive. "No matter which Nintendo system you own, every member of the family will have fun playing." Additionally, Ubisoft brings Rayman Legends online for the first time with a new demo, including the full online challenge mode. The online challenge mode is made up of four levels, including "Murfy's Dungeon," exclusive to Wii U. New challenges are added daily and weekly, and each comes with its own individual leaderboards. The demo will be available in late April. "Wii U gives both games a second-screen experience that fans will enjoy," said Tony Key, senior vice president of Sales and Marketing, Ubisoft. "The genres are different, yet both games share fun game play and replayability." Injustice: Gods Among Us from Warner Bros. Interactive Entertainment launches April 16 with off-TV game-play functionality and an optional "Quick Moves List" lookup on the GamePad while the game plays on the television. Batman and Robin return in LEGO® Batman™ 2: DC Super Heroes this spring for Wii U from Warner Bros. Interactive Entertainment, with off-TV functionality and enhanced interactive map viewable on the GamePad. Resident Evil®: Revelations from Capcom returns on May 21, redefined for Wii U with exclusive Miiverse features, including the ability to post a dying message on the Game Over screen for other players around the world to see, and the "Creatures Voice" function allowing players to personalize the thoughts of enemies in Raid Mode and taunt their friends. Fast & Furious™: Showdown from Activision launches May 21 with adrenaline-packed racing action for Fast & Furious fans. Coming soon to Wii U, DEUS EX: HUMAN REVOLUTION® – DIRECTOR'S CUT from Square Enix is packed with new features exclusive to the Wii U, including Miiverse integration and multiple game-play improvements leveraging the Wii U GamePad. DuckTales Remastered from Capcom: Releasing this summer, DuckTales Remastered is a hand-crafted, beautiful HD reimagining of one of the most iconic Disney 8-bit titles that follows the adventures of Scrooge McDuck as he explores differently themed worlds to collect their treasures and become the world's richest duck. Dungeons & Dragons®: Chronicles of Mystara™ from Capcom brings HD re-workings of two of Capcom's classic arcade hits – Dungeons & Dragons: Tower of Doom andDungeons & Dragons: Shadow over Mystara – together in one definitive digital package in June, complete with a wealth of enhancements and game-play options. Scram Kitty and his Buddy on Rails marks Dakko Dakko's Nintendo eShop debut. A frenetic action platform game with unique controls and a striking visual style, Scram Kitty and his Buddy on Rails will be released for Wii U later in 2013. About Nintendo: The worldwide pioneer in the creation of interactive entertainment, Nintendo Co., Ltd., of Kyoto, Japan, manufactures and markets hardware and software for its Wii U™and Wii™ home consoles, and Nintendo 3DS™ and Nintendo DS™ families of portable systems. Since 1983, when it launched the Nintendo Entertainment System™, Nintendo has sold more than 4 billion video games and more than 651 million hardware units globally, including the current-generation Wii U, Nintendo 3DS and Nintendo 3DS XL, as well as the Game Boy™, Game Boy Advance, Nintendo DS, Nintendo DSi™ and Nintendo DSi XL™, Super NES™, Nintendo 64™, Nintendo GameCube™ and Wii systems. It has also created industry icons that have become well-known, household names such as Mario™, Donkey Kong™, Metroid™, Zelda™ and Pokémon™. A wholly owned subsidiary, Nintendo of America Inc., based in Redmond, Wash., serves as headquarters for Nintendo's operations in the Western Hemisphere. For more information about Nintendo, please visit the company's website at http://www.nintendo.com.